At times, some people seem to have such a hyperactive mind, don't they? They may be with you physically, or even on phone or internet chat, and yet seem so far away. They keep talking and talking and talking... about random disconnected things. They may be doing something, e.g. eating, and still keep talking hurriedly... as if they're in a constant rush. They'll be gobbling up their food without paying any attention to it. It's like their mind is so full... of so many odd things! And then there are others who seem totally relaxed and calm. They pay complete attention to whatever they're doing. Their conversations have proper coherent threads. They talk slowly and thoughtfully. They are equally attentive listeners too. Completely focused. 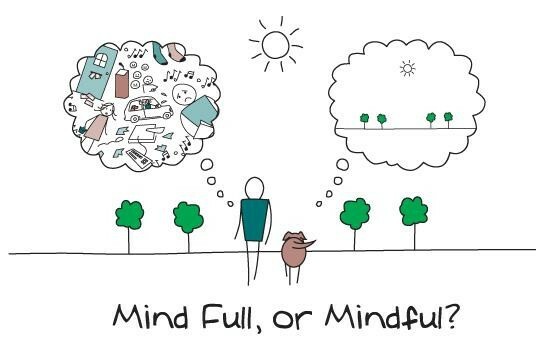 So what is your state of mind today... mind full, or mindful? Hi Avada... most of us are, I guess. Some more than others. Babies seem completely mindful though. I experience rare occasions of mindfulness amidst a more dominant state of mental chaos.